Skypaw stared her paws. Her eyes were wide with shock, but she refused to make eye contact with the pelt she knew all too well. The pelt that ShadowClan cats wanted to rip to shreds. Willowleaf acted as if nothing happened. Skypaw could tell that she was confused on how to act. "Russetsky!" Dapplestar was hissing wildly within seconds. The pelts of ShadowClan cats had risen again, and Skypaw found it amusing how much ThunderClan cats ruffle their fur. "I come in peace." Russetsky looked her mother in the eye showing no emotion. Skypaw snook a peak at her. Skypaw tried to blend in with the ShadowClan cats, hoping she wouldn&apos;t be caught in such a place. Her Clan must be angry at her for running off, and she wondered how many figured she&apos;d been with Willowleaf. Her plan failed when her and her mother met gazes. Russetsky didn&apos;t look angry, or surprised. Her fur layed flat and her tail wasn&apos;t held high, but it wasn&apos;t drooping. Skypaw switched her gaze to Willowleaf, surprised. Willowleaf looked at her with certainty. "Why are you in our camp?" Frosttail growled. "ThunderClan, get your paws off our territory!" "Frosttail," Russetsky meowed calmly. "I believe it was ShadowClan who tried to take over our forest." Skypaw knew Russetsky was the cat that made the white warrior race back to camp. Skypaw&apos;s pelt still pricked with pride, and Frosttail seemed to remember it too. She quieted down quickly, and Russetsky&apos;s eyes shone with something that Skypaw figured was triumph. Skypaw could still hear the trees crashing down, and the roar of the monster came into earshot. Her fur rose slightly, and Russetsky&apos;s eyes shone with alarm. "What&apos;s that?" She questioned. "None of your business!" Ratscar snapped. Russetsky glared at him. "Take your cats and leave," Dapplestar growled lowly. Skypaw glanced at Willowleaf, who stared at her paws. She moved her gaze to Russetsky. The russet she-cat didn&apos;t seem affected when the ShadowClan cats still believed Willowleaf was their medicine cat. "As you wish," Russetsky meowed, her tone still calm. Skypaw admired how Russetsky was being more mature than her own mother. The ThunderClan deputy flicked her tail as a signal, and Skypaw and Willowleaf were on their paws following her within moments. "Remember," Willowleaf meowed over her shoulder. "Run, or die." Skypaw didn&apos;t look back at the camp. She saw her mother&apos;s pelt rise briefly at Willowleaf&apos;s words, and she knew how horrible that sounded. However, her fur layed flat again quickly. Russetsky looked over her shoulder at the two she-cats. "Let&apos;s get out of here," She meowed. "Whatever is back there is approaching and it&apos;s only going to cause trouble if we take our time." With that, the ThunderClan deputy raced off. Skypaw&apos;s paws were still in pain from the pine needles and were a mess because of the slippery marsh, but Russetsky and Willowleaf didn&apos;t seem to have a problem. The reasons the two she-cats had experience in ShadowClan&apos;s territory sent her skin crawling, so she pushed them out of her mind. Instead, she looked at the stars, which scattered back into their normal places in the sky. Skypaw looked at them for one more moment before returning her eyes to the ground. She had to watch this unfamiliar territory for dangers. She wanted to think about the prophecy, but she figured she needed a break from it. She had to take time to be a normal ThunderClan apprentice, right? In the morning, she knew Russetsky would get her up and training bright and early. Hazelflower and Skypaw had fallen behind due to the sudden bursts of battles and the fact that Skypaw ran away, something that Sunstar certainly would not approve of. Skypaw dreaded training. She loved being an apprentice, but she just wanted a few days to let her wounds heal and to sleep. She may just seem like a trouble-some apprentice to her Clanmates, but she knew that some cats knew that she wasn&apos;t doing nothing. She was trying to make sense of herself and what StarClan had chosen her for. She sighed. If she ever wanted to become a warrior, she had to work hard. "Rainpaw is training again," Russetsky commented, trying to start conversation. Skypaw heard Willowleaf take in a sharp breath. "She wasn&apos;t ready!" Willowleaf stressed. "Who let her?" "Sunstar did." 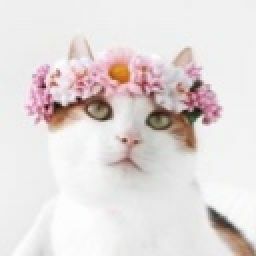 Willowleaf and Russetsky shared a glance. "Bramblefrost and I protested against it, but there&apos;s only so much we can do." She felt her mother&apos;s eyes burn her pelt. Willowleaf and Skypaw made contact for a moment before the former medicine cat spoke up. "She knows, Russetsky." Russetsky looked at Willowleaf with shock. "How?" Her eyes were wide. "StarClan showed her in a special way," Willowleaf meowed carefully. "What about Shadepaw and Rainpaw? Do they know?" Skypaw hated the fact that Russetsky acted as if Skypaw wasn&apos;t even here. "Why did they show Skypaw?" "Skypaw is the sky in the prophecy," Willowleaf whispered. "She is the sky that will fall." Dead silence filled the clearing as Russetsky&apos;s jaw dropped to the forest floor. Only when Skypaw turned to look to see where they were did she see the fiery pelt and the piercing green eyes narrowed into a hard glare at the ThunderClan scent line. I know, this chapter pretty much sucked. Sorry guys, I have a really bad headache, therefor had writer&apos;s block. I was going to hold off and write it, but I haven&apos;t updated since Thursday and I felt like I needed to. 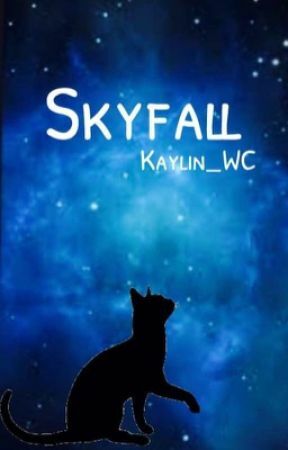 Thank you to all the people who have been private messaging me great things about Skyfall! And, a thank you to all the voters, commenters, and followers of mine. Please vote, and if you have any questions feel free to ask!